Marketing your book online is a very cost-effective way to increase sales. But, what if you could get your book in front of people like agents, scouts, and movie or TV production/development professionals in a much more personal way? Think of the possibilities! Each year, BookExpo America (BEA) draws over 100,000 attendees, making it the largest gathering of authors, booksellers, publishers, and industry professionals in North America. And while attendees come from all over the world, the BEA focus is squarely on American books, publishers, and authors — offering U.S. authors a golden opportunity to expose their work to those who live and breathe books. Shouldn’t YOUR book be part of the action? If you’re looking to get your book into the hands of one of these important contacts to further launch your career as an author, Outskirts Press can help. Outskirts Press authors participating in the BEA Book Fair will receive valuable, face-out exposure of their book on an exclusive shelf with four other Outskirts Press titles, and a representative will be present to answer questions about your book. Your title will also be featured in the trade show catalogue as a “title on display,” which industry professionals can access at a later date as needed. We’ll also forward any contact we receive regarding your book directly to you for personal follow-up. 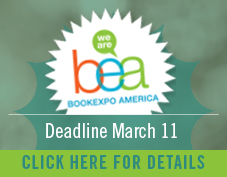 The 2016 BookExpo America takes place May 11-13 in Chicago, Illinois. The deadline to register your book is Friday, March 11th. Make sure your book is there and reserve your space now!